Pfeiffer Cranes has built its reputation for quality reliable service to the construction industry since 1981. We have the right blend of passion, experience, commitment, and understanding of the work environment that sets us apart from the competition. We are a mobile crane service with a focus on creating fast, efficient and safe erection of buildings, bridges, transformers and house relocation, with a history in mining and construction that dates back 30 years. Our all-terrain mobile cranes range from 4 tonne up to a 400 tonne capacity. Pfeiffer Cranes focus on employing only the best and experienced operators to provide a quick and efficient service. The company was started by Fred Pfeiffer in 1981 and remains family owned and operated to this day. Under his guidance his sons Dan and Craig are now experienced, skilled operators capable of working on a vast array of different jobs. They are now competently gaining work through their reputation as skilled operators. Pfeiffer Cranes engineering section is run by Jack Pfeiffer who manages all drawings, Occupational Health and Safety issues, Lift Studies and Job Safety Assessments utilising automated CAD drawings and 3D lift plans. Royal Hobart Hospital - 66 Tonne dual-capable hypo/hyperbaric oxygen chamber installation + Tower cranes installations. Fred Pfeiffer began his working life with The Independent Roofing Company in 1964, based at Renison Bell Tin Mine. He gained confidence working at heights, and after two years of this, he commenced work as a construction rigger and foreman with Haywards, one of two steel fabrication and crane hire companies in northernTasmania at the time (the other was A.E. Jack). After working at Haywards for 13 years, most of which was spent at Wesley Vale, Fred moved to the Australian Crane Company, also working as a construction rigger and foreman. When Fred left in 1981 he came home to Delcie to say that he wanted to start his own company. It began as a partnership with his wife under the name I&D Pfeiffer and later become a company Pfeiffer Cranes Pty Ltd. He had some work at Tasmanian Alakaloids but needed to go and borrow $3000.00 to start the business. They had little money and three boys to support. The next day Fred travelled to Fingal Coal looking for work in construction. It was at this time that he won a large contract at Fingal through another company called McNally and for the first year hired in a crane from Brian Jones who resided in Hobart. It was in his second year as a business owner that they were to buy their first crane which was the P&H 20t crane..Fred and his wife Delcie started their own company, Pfeiffer Cranes, in the small northern Tasmanian town of Carrick. This company also engaged in steel fabrication and erection, and crane hire. Pfeiffer Cranes went from being a partnership to a company in 2002. Pfeiffer Cranes’ first contract was with the Fingal Coal Company, a large coal mining operation on the Fingal Valley, which provides most of Tasmania’s coal. The contract allowed Pfeiffer Cranes to buy its first crane, a 20-tonne P&H T200 hydraulic truck crane. 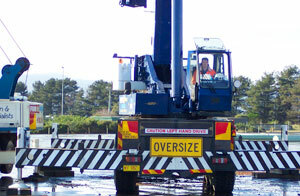 At this time the largest crane operating in northern Tasmania was a 45-tonne Kato truck crane. This project started Pfeiffer Cranes on a growth path that has led to it becoming a respected crane hirer in northernTasmania, and Fingal Coal Company remains a customer to this day. Over time the truck crane fleet built up to T200 was replaced with a 30-tonne Kato NK 250 V2 truck crane that remains in the fleet, a 45-tonne Kato NK 450 truck crane was bought and later replaced with a 50-tonne Kato NK 450 BV truck crane, and a second 50-tonne Kato truck crane was added. A 12-tonne Franna was also added to fleet because of its quick set-up time and manoeuvrability, and remains in the fleet. The fleet changed dramatically when a 70-tonne Krupp all terrain crane was bought, when Pfeiffer Cranes won a contract to fabricate and erect an Otway Fly Airwalk at BeachForestin Victoria. At the time of purchase, all-terrain cranes were rare in Tasmaniaand a 70-tonne hydraulic crane was a large machine for the state. This crane was later replaced with a new 80-tonne Grove GMK 4080, which remains in the fleet and has been joined by two other Grove all terrain cranes, a 100-tonne GMK 5100 that bought from the Australian Antarctic Division after it worked in Antarctica for two years and a 55-tonne GMK 3055 bought new to replace a 50-tonne truck crane. With the growth of the fleet, a depot was bought in Launceston. This is fitted with a hard stand area, wash bay, mechanical service pit and a shed that allows the cranes to be parked under cover. The growth of the business has meant that Pfeiffer Cranes started dealing with major companies such as Rio Tinton, BHP Billiton, Theiss, Van Ek Contracting and Tasmanian Alkaloids, which had particular requirements for doing business. Pfeiffer Cranes has adapted to the requirements of companies such as. Current requirements such as Job Safety Analysis, Lift Studies, Lift Plans and tagged rigging gear that requires inspection every three months were not part of the requirements of doing business in earlier times. Pfeiffer Cranes have this year purchased a brand new Grove 220t crane and through this purchase have been awarded some larger projects them bein. The Brighton Bypass in Hobart which was award to the by Theiss/Van Ek Contracting. This job involves lifting bridge beams into place that weigh approximately 63 tonne each. With this crane bring bigger jobs but also a larger level of safety. For many jobs now we need to have engineered plans for the crane setup and how the task is going to be carried out. It is through ‘Engineering Plus’ that we complete these drawings for Pfeiffer Cranes. Some drawings are very detailed and complex due to the specialised work of the large cranes. The fleet has also increased to include a Kato 13t City Crane that allows easy operation in tight areas around the city of Launceston.